For those with style you definitely have to check out the Diamond Grind aluminum colored grinder. It comes in a large assortment of colors with one of them sure to fit you. It has a very durable anodized aluminum build making it last a very long time so you won't have to worry about replacing it any time soon. 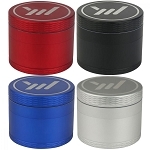 The small size is 50mm (about 2 inches) which is a perfect size to make this grinder easily portable.